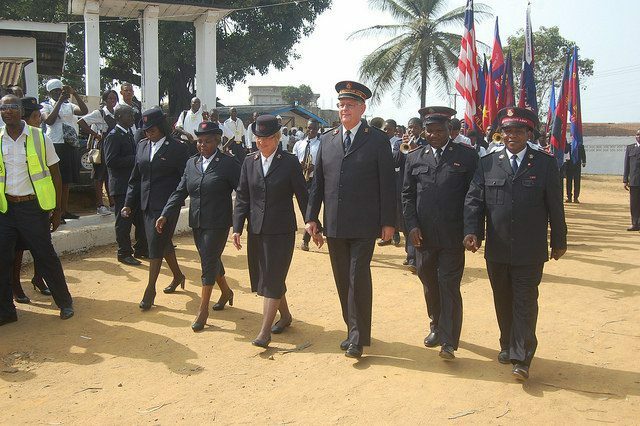 General André Cox and Commissioner Silvia Cox, World President of Women’s Ministries, led the celebration of The Salvation Army’s 30th anniversary in Liberia with worship, the opening of a new Salvation Army school and by showing appreciation for the support of the country’s former president. 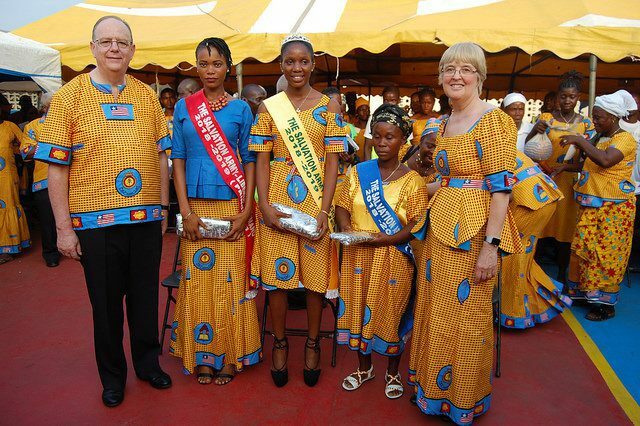 The international leaders were given a warm welcome at Roberts International Airport near Monrovia. Salvationists, students and friends gathered to greet the visitors, cheerfully singing the chorus “Joy! joy! joy! 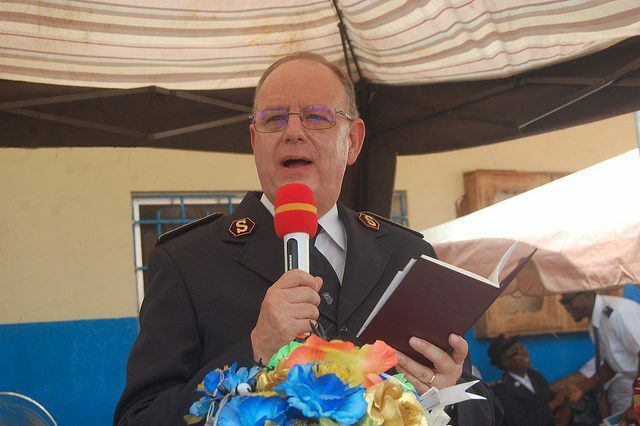 There is joy in The Salvation Army.” In an interview with local media representatives, the General emphasized that the visit was intended to encourage and motivate Liberians with the message of Jesus Christ. 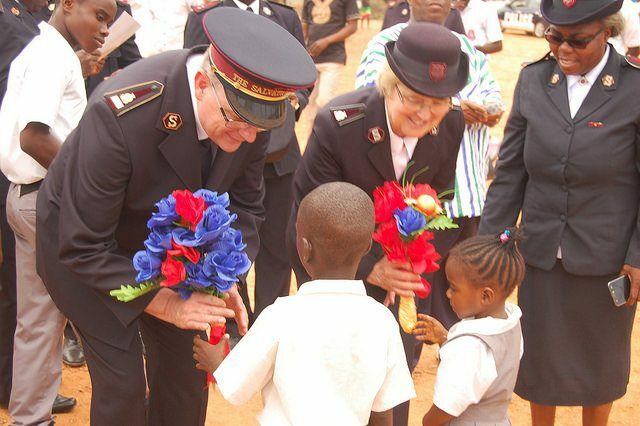 The next day the General toured Liberia Command Headquarters, where he encouraged the staff to uphold the standards of The Salvation Army at all times. Later, addressing the national media, Cox said he foresees great potential and a brighter future for Liberia. 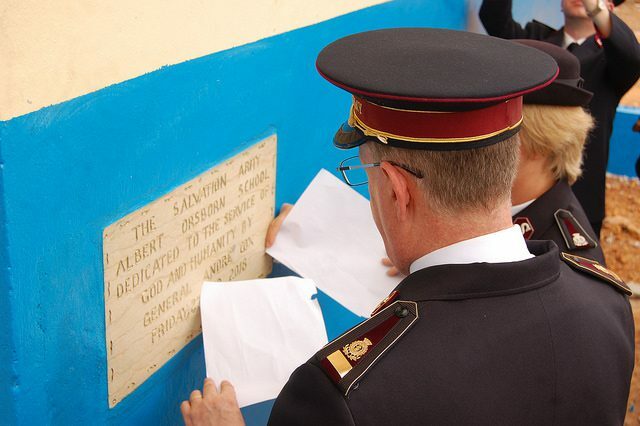 The international leaders traveled to Kakata in Margibi County, where they dedicated to God and opened a newly constructed 12-classroom building, the Albert Orsborn School—named after The Salvation Army’s sixth General. The district legislator, superintendent, city mayor and the government’s county education officer were in attendance. 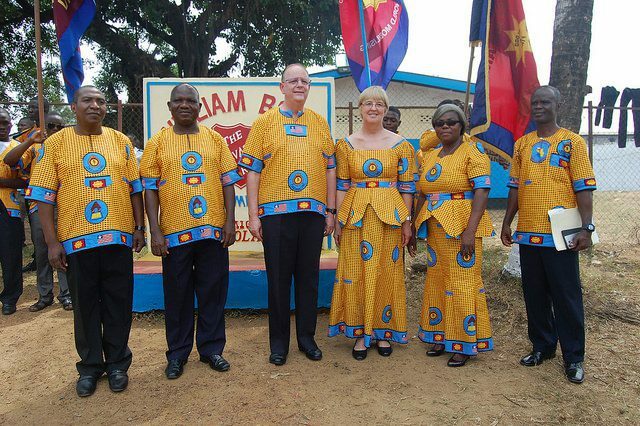 In separate remarks, each expressed gratitude to The Salvation Army for its meaningful contributions toward education in Liberia, where it oversees schools and a college in 11 separate locations. In response, the General thanked the government for its partnership and encouraged the school’s students to have hopes and dreams for the future, emphasizing that education is important but that, without knowing God, it is worth nothing. 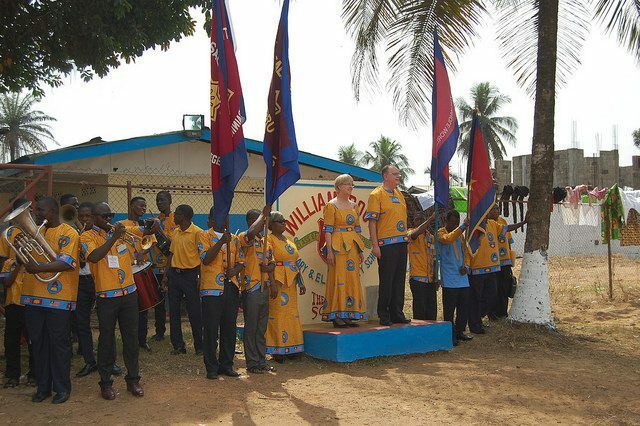 After the ceremony, the Coxes traveled back to Monrovia for a welcome meeting at the William Booth compound in Paynesville. 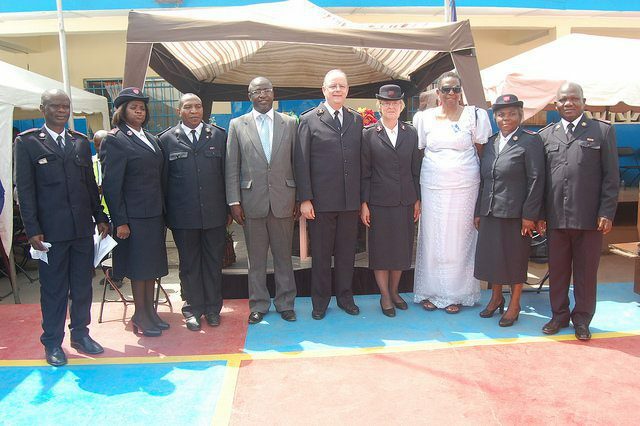 A congregation of more than 1,200 Salvationists, students and friends joyfully participated in the program. Thirty-five people moved forward to the mercy seat in acts of dedication. 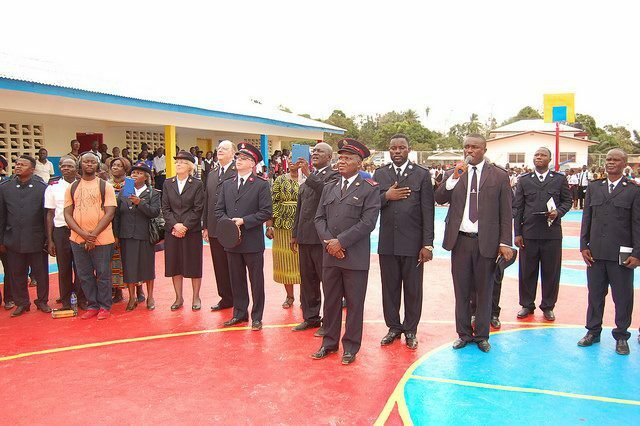 The following day started with mobilization and open-air meetings in Paynesville, with hundreds of Salvationists and students parading through the streets. This was followed by the youth, women’s and men’s rallies. The evening hours witnessed the display of traditional performances from a variety of groups. 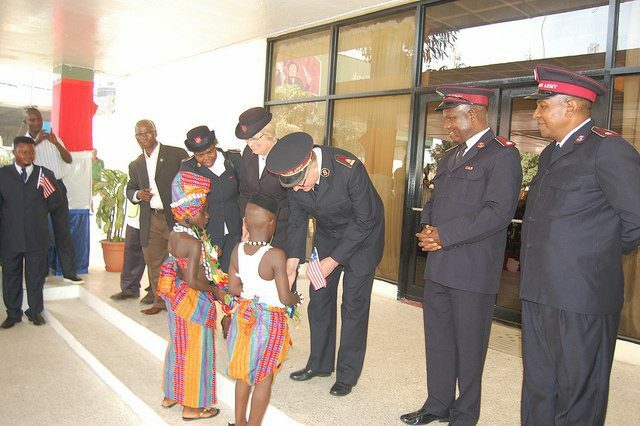 A special ceremony was conducted by the General to honor the former President of Liberia, Her Excellency Madam Ellen Johnson-Sirleaf, in appreciation for her contribution toward rehabilitating the William Booth School after a devastating fire in 2015. The General presented Madam Johnson-Sirleaf—who was President of Liberia from 2006 until earlier this year, and was jointly awarded the Nobel Peace Prize in 2011—with a certificate of appreciation on behalf of the Liberia Command. 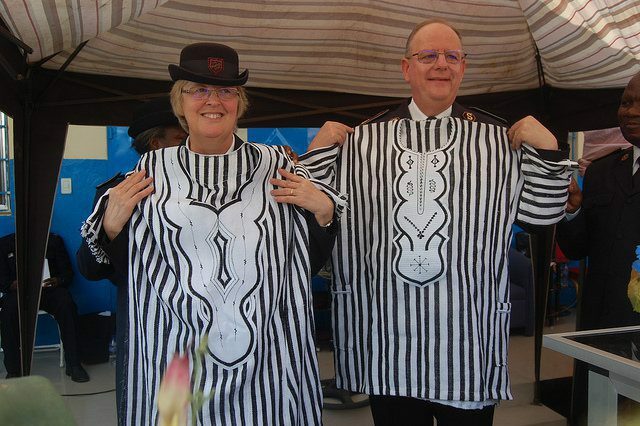 Among the congregation of more than 1,500 people at the Sunday morning holiness meeting were representatives of the Liberia Council of Churches, South African Ambassador Vanapalan Punjanathan Moodley and county senator the Hon Jim Tonorla. Cadets were given their appointments, and 20 junior soldiers and 114 senior soldiers were enrolled by the General. Forty-nine soldiers responded to the appeal for officership. The General encouraged his listeners to put Christ at the center of all their undertakings. A total of 131 people responded to the General’s challenge by kneeling in prayer at the mercy seat.